2. Knolls, Major William FRGS. Hand Book of Field Fortification. London: Straham & Co.(1873); Pages 232-243 "Mining"
Remember: We also sell Volume Two. 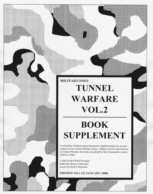 And have seven other volumes and supplements in our Tunnel Warfare series.